BuenosTours sells private guided walking tours (sometimes also involving local forms of transport such as taxi, subway, bus, private vehicle hire etc) in Buenos Aires, and also acts as a re-seller for tango dinner-shows, wine tastings and day trips in and around Buenos Aires. We are proud to be the first company to specialize in private guided walking tours in Buenos Aires, which we started to offer back in 2005. The only personally identifiable information that BuenosTours collects and keeps on file from our customers is their name and email address. This information is used only to confirm your tour details via email and may be used occasionally in the future to announce new BuenosTours services, and the services of other companies managed by / in coordination with BuenosTours, to you (you can immediately opt out of such emails by informing BuenosTours that this is not desired). BuenosTours does not share this information with anyone else. Just like you, BuenosTours hates spam! All online credit and debit card payments to BuenosTours are processed directly through the online payment processors Paypal and Stripe. In this case, your card information is not only not stored by, but also never even sent to, BuenosTours: it is only dealt with by Paypal or Stripe – please refer to their policies for more information. On occasion, at your request, BuenosTours may take your credit/debit card details over the phone, when you prefer not to pay online. In these cases, after the payment has been processed, BuenosTours will never store any of your card details in any way, shape or form. 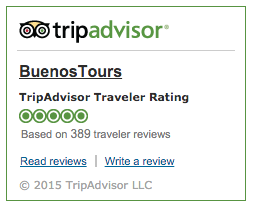 BuenosTours does not accept card details directly from you in any written form, such as mail, email or fax. 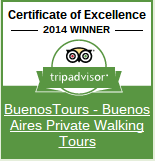 BuenosTours only sells services in Buenos Aires, and no physical or digital products of any type. Therefore everything that BuenosTours sells is received as a service by you in person in Buenos Aires, and no shipping policy is required – this section only exists to confirm this fact for compliance purposes. Although very unlikely, in the case of extremely heavy rain or thunderstorms BuenosTours’ walking tour services sometimes have to be curtailed, canceled or rearranged for another time/date. If you are unsure about this possibility on the scheduled day of the tour, please call your tour guide (we give you their contact number in your booking confirmation email) or failing that, the BuenosTours answering service on 5235 7020 (as dialed from an Argentine phone, from within the city of Buenos Aires), or +54 11 5235 7020 (if calling from an international/cell phone). Of course, in the unfortunate event of a heavy rain cancellation (with no possibility for rearrangement) or curtailment, BuenosTours will refund you for any tour services not provided (on a pro rata basis). After booking any service with BuenosTours, if you decide to cancel the service with more than one week’s notice before it is due to take place, or if it can not take place for reasons outside of your OR our control (i.e. a very heavy rainstorm, or a flight/cruise ship delay or cancellation) AND it then cannot be rearranged, then BuenosTours will NOT charge you for the service AT ALL (if you have already paid in part or in full, BuenosTours will refund you that amount paid in full). However, if you cancel one of our walking tours with less than 1 week’s notice, or “no show” (do not turn up for the tour, having not given a written – i.e. email – notice of cancellation to BuenosTours), you will be charged for 20% the stated value of the service (BuenosTours will refund anything over this amount if you paid in full in advance of the service). Also, if you cancel a tango show or wine tasting booked through BuenosTours with less than 72 hours notice before it is due to take place, you will be charged for 100% of the stated value of the service – this is not our policy, but something we have to enforce on behalf of the providers of these services. We will of course help to rearrange your booking if you wish to do so, whenever possible. In regards to “returns”, BuenosTours offers a 100% satisfaction guarantee for its walking tour services (other services offered through us as a re-seller are not included in this policy): if you are not completely satisfied with your walking tour, you will receive your money back in full. To be eligible for this returns policy you must have already paid in full online in advance for the tour, and you must request this full refund from the guide that gives you the walking tour immediately after it has been completed, and confirm your reasons why to the guide. All refunds will be returned by BuenosTours to you by the same method of payment you have already used (e.g. if you pay via PayPal or credit/debit card, BuenosTours will not be able to offer a cash refund). Please refer to our private walking tours terms and conditions page for further information on cancellations, refunds and related topics. BuenosTours endeavors to respond to emails within 3 working days. Business hours are 9am to 7pm Buenos Aires time (GMT -3), Mondays to Fridays.